3 Steps to a Great "Baseline Set-Up"
It’s no good making random adjustments to your race car set-up at the race track. You'll most likely get lost with the changes you make, and end up not making the car any faster. Magazine articles, "cheat sheets", and generalized advice you get on set-up from internet web sites, are particularly unhelpful. No wonder the general impression most racers get is that handling, as it applies to set-up, must be very complicated. Even someone highly experienced both as a driver and a set-up engineer cannot tell what you need straight off. They can't just jump in your race car, do some laps, and then say you need XYZ springs and anti-roll bars. What you need is a baseline set-up. The set-up we know is close to optimum. Then in testing, you and/or your team, can decide what changes you’ll try. At Racing Car Technology, the baseline is the set-up we can do in advance in the workshop, then go to the track knowing we are in the set-up window. Make further adjustments at the track to fine tune. Get the balance that’s fastest and best suits the driver. 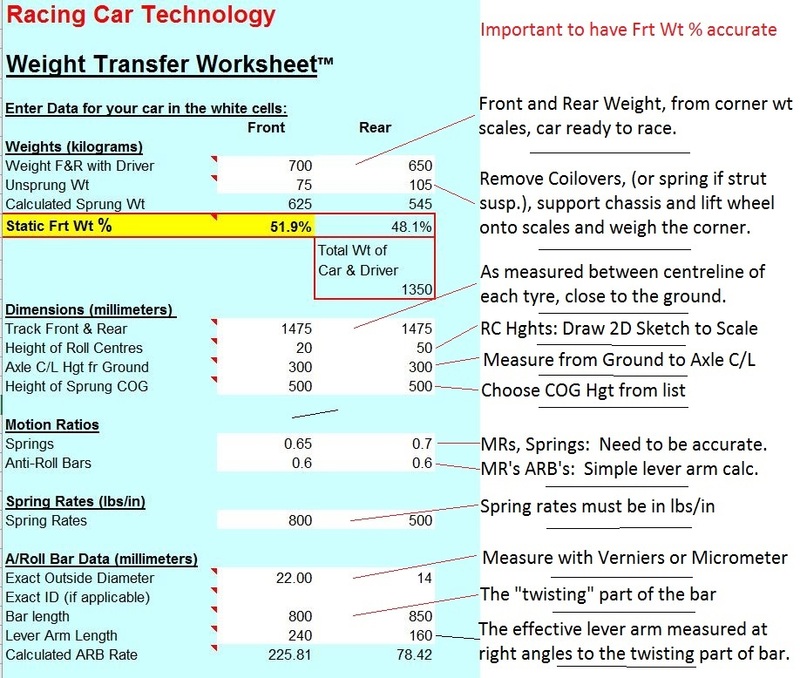 We work out what's required for the set-up using a spreadsheet calculator we’ve developed, called the Racing Car Technology Weight Transfer Worksheet™. In the screen shot above, see a quick overview of the input data, an example of the weighing and measuring required. It’s an all-in-one solution to help you get the most from your racing through good set-up. It works no matter what your situation in racing - whether you’re setting up an occasional track day car, or a full-on race car for national competition. Your baseline set-up for best mechanical grip, and better balance for understeer/oversteer. For an optimum set up, we’re talking fitment of anti-roll bars front and rear. At first sight, the role of the anti-roll bars may not appear that significant. But the more you’re involved with suspension set-up, the more you’ll understand their importance. Most racers themselves, and their suppliers of aftermarket suspension, do not realize we can readily specify the anti-roll bar stiffness required (size the anti-roll bars) and decide on the degree of adjustability we want, as part of our baseline set-up. They are the best way for you to limit roll and balance the car for understeer/oversteer. Decide on the “spring rate” front and rear (the spring stiffness in lbs/in or kg/mm etc) for best response and grip at the tyres. We give you guidance as to what suspension stiffness (ride stiffness) will work best for your use of your race or road performance car. *NOTE: If you have compromised or no anti-roll bar front and/or rear, you should still perform the calculations to get the balance by other means we show you. Done right, just these 3 simple steps can transform the handling of your race car. Many of our clients gain seconds per lap with these ground-breaking procedures. You can do all this in our Racing Car Technology Weight Transfer Worksheet™.